The Berkman Klein Center summer internship program is a cohesive, integrated experience that brings together students from around the world to work closely with faculty, staff, and fellows on a wide range of projects and initiatives related to the internet and society. Over the last ten years, more than 400 interns have joined us in Cambridge to conduct research, exchange ideas, gain exposure to new areas for exploration and study, expand networks, and form friendships. Providing this 10-week intensive paid experience for students from a wide range of backgrounds and areas of interest, ranging from high school to PhD level, is one of the main ways the Center demonstrates its commitments to education, diversity, and network-building. The length of time and intensity of the experience allows interns to form lasting bonds with each other and with the Berkman Klein Center. Many interns return to join us as staffers or fellows, or stay in our network through ongoing projects or by joining a peer institution. While the Center has provided opportunities for students to participate in our research projects since it’s earliest days, it was in 2008 that we began a deliberate effort to provide a structured community experience for a cohort of interns, and since then the program has grown considerably. In 2008, we welcomed 31 interns drawn from a pool of 66 applicants. This summer, we welcomed nearly 50 interns to Cambridge selected from a pool of more than 1,000 applicants. From the beginning, the summer interns have reflected the global nature of our community, with seven countries represented in our 2008 cohort, and more than 15 countries, including Colombia, Spain, Nigeria, and India, represented in 2017. 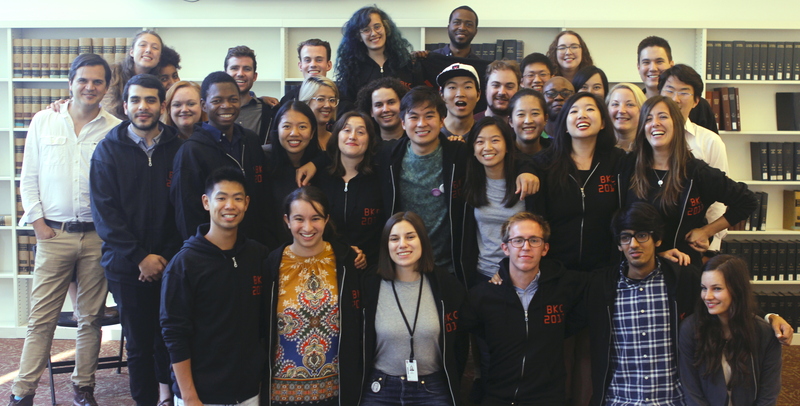 This summer, interns worked on more than 17 projects around the Center, including the Ethics and Governance of Artificial Intelligence, Youth and Media, Harmful Speech, Privacy Tools, Lumen, Internet Monitor, the Harvard Open Access Project, Global Access in Action, and the Cyberlaw Clinic. In addition to working closely with their research teams, interns had opportunities to showcase their expertise and interests through skillshares and formal talks, and were able to get to know the Berkman Klein community through weekly programmed “intern hours,” and BKC public events, and more informally through social gatherings and connections formed from working amidst the activity here at 23 Everett Street. Each summer, interns also participate in a group project, which in the past has resulted in explainer videos, interviews with incoming community members, and, this summer, online learning experiences for students on topics such as cybersecurity, digital health, and freedom of expression. These learning experiences will be published and made freely available on the Digital Learning Resources Platform. For an intern’s inside look at the summer 2017 experience, visit Summer Snapshot 2017, created by BKC communications intern Tym Yee. And check out the the summer internship page for more information about the program and to learn when and how to apply.